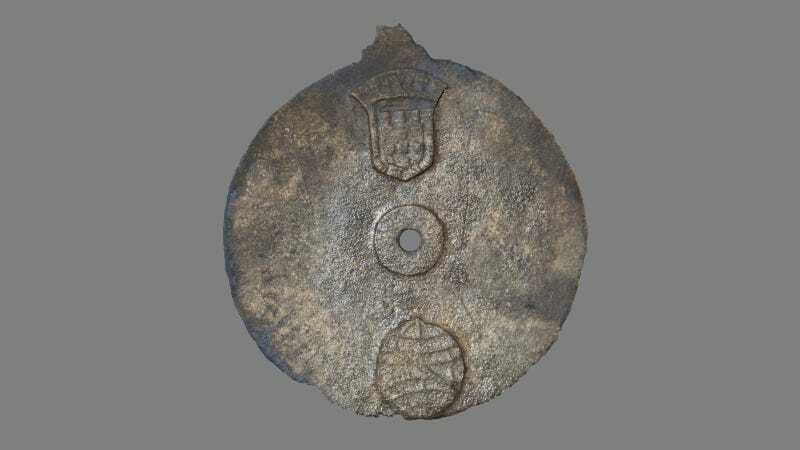 Scientists have confirmed that a gunmetal disk uncovered off the coast of Oman is the oldest known mariner’s astrolabe, according to a new study. The disk was found underwater at the Sodré shipwreck site, and contained iconic Portuguese imagery still found on the flag of Portugal. Though it appeared to be an astrolabe, it required further confirmation. Laser imagery from scientists at the University of Warwick in the United Kingdom has now revealed scale markers along the disk’s edges, confirming that it was in fact an early navigational tool. Astrolabes were instruments used by mariners beginning in the late 15th century to determine latitude, which they did by pointing the disk at the Sun and reading the markings on its sides. “It was like nothing we’d excavated on the site before,” David Mearns, a deep sea search and recovery expert from Blue Water Recoveries who found the astrolabe, told Gizmodo. The astrolabe still underwater at the site. Mearns led the mission to excavate the wreck and found the object in 2014. The Portuguese shield and armillary sphere, which both appear on the country’s flag today, were immediately identifiable—but the disk’s function wasn’t confirmed beyond suspicions, at first. After all, astrolabes are rare; only 104 have ever been discovered. In 2016, engineers from the University of Warwick visited Muscat, Oman where the item was held and scanned it in 3D with a laser. The scans revealed 18 scale marks along the upper right of the disk, which the scientists infer were five-degree marks. Perhaps the one-degree marks eroded away. Though the exact date of the astrolabe’s creation is unclear, the date of the Sodré shipwreck alone confirms it as the oldest surviving example yet found, according to the paper. Additionally, it tells the story of the development of astrolabes themselves. Unlike later astrolabes that were an open wheel, the Sodré astrolabe was a solid disk. The researchers behind the paper explain that later astrolabes were heavier and had openings cut in them to reduce wind interference, making them more stable. “By comparison, the earliest astrolabes made of wood, or the solid disc type, would have been relatively primitive instruments prone to instability with gusting winds at sea and not particularly accurate,” they write. The astrolabe now appears in the Texas A&M University’s inventory of mariner’s astrolabes, and has been independently certified by the Guinness Book of World Records as the oldest astrolabe. It’s presently housed at the National Museum in Muscat, Oman.